I like big animals, so today I want to write about the colossal squid, one of the largest animals roaming the oceans. Measuring up to 46 feet long, they are the largest invertebrate in the world. They have the largest eyes in the animal kingdom, measuring up to 12 inches across. Despite their massive size, colossal squid weren’t discovered until 1925 when two tentacles were found inside a sperm whale. Sperm whales are the only predator of adults, but they put up a fight, with scars often seen on the backs of sperm whales from the sharp hooks of their tentacles. They are found in the deep, freezing cold waters around Antarctica and up to the southern parts of South America, South Africa and New Zealand. 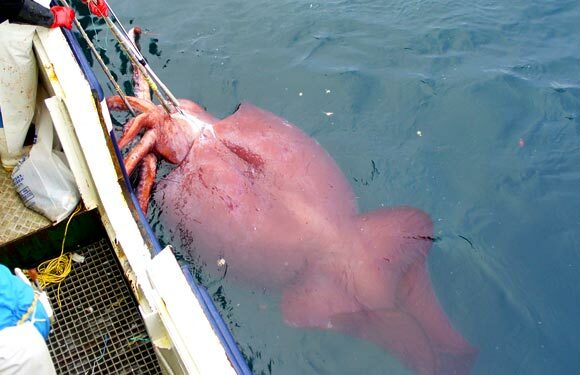 Are there any other interesting facts that you would like to share about colossal squid? That is one incredible animal! The name of the animal along with the picture really makes my stomach churn. I would not like to meet one of those. Now, just out of interest, how many of these gigantic creatures have actually been found, dead or alive? That is a crazy weird animal. I have never heard of that big of a squid! It does look kind of scary. I don’t know if I would want to be near one! But now I know about them! Have you seen in real life every thing you write about? I can assure you that Hayden hasn’t seen every animal that he has written about, although he has seen a few of the Australian ones. Ok, I wasn’t sure that he had, I didn’t think he could have possibly seen all of those animals! Thanks for the answer!